ColorSource Linear, a LED luminaire crafted by lighting experts, is contained in a strip light, or batten, form factor and uses the same proportionate recipes of red, green, blue, and lime LEDs as the ColorSource PAR. This creates a color range and richness only possible from ETC LED luminaires. The Linear fixture was designed to allow multiple fixtures to be mounted end to end with no visible break in light. 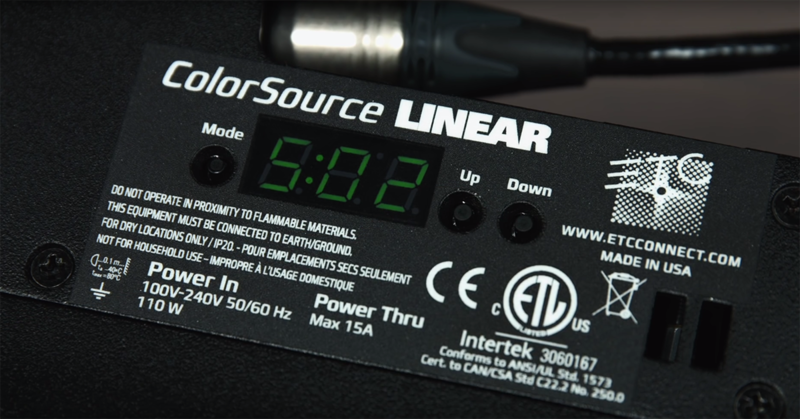 The ColorSource Linear lives up to ETC's high standards for quality. Available in original or Deep Blue array options. 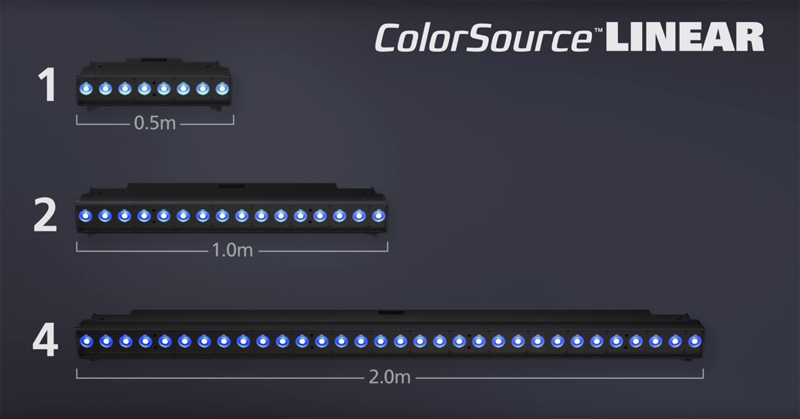 The ColorSource Linear fixtures are available in three different sizes. The 1,2 and 4, which are respectively half a meter, one meter and two meters. Every half meter is individually addressable and controllable. Whether used to deliver a beautiful stage wash or to graze a wall with an endless colour palette, ColorSource Linear will exceed your expectations of quality and performance. ColorSource Linear combines amazing value with high output, simple controls, solid construction, optically calibrated arrays, RDM setup and droop compensation for colour consistency. The simple 7-segment display and navigation buttons allow quick access for setup and recalling built-in presets and sequences. The fixtures come standard with powerCON In and Thru-connector as well as DMX In and Thru via 5-pin XLR. The fixtures were designed to be low-profile when sitting directly on the ground and they each will ship with a pair of trunnions. C-clamps can also be attached for overhead use. At the front, each half-meter section consists of 8 homogenized optics which contain ETC’s original mix of LEDs and deliver as much output and colour quality as is available in a four colour system. The ColorSource Linear fixtures all have two slots in front of the optics for mixing and matching a large variety of diffusions to create any beam shape you might need, from linear, to oblong, to round and ranging from 25° to 100°.